At approximately 3:05 p.m. on August 2, 1964, USS Maddox fired three warning shots at three North Vietnamese P-4 patrol torpedo boats approaching the destroyer at high speed. Over the next 20 minutes, the Maddox fired more than 280 5-inch and 3-inch rounds at the fast-moving and evasively maneuvering PT boats. Two of the boats fired their 14.5 mm machine guns and released their torpedoes at the destroyer. One 14.5 mm round hit the Maddox’s bridge wing but both torpedoes missed. The North Vietnamese crews had launched them from too far away. All three PT boats were damaged by the follow-on airstrike in support of the Maddox. That attack was a factor in Congress’ Aug. 7 Gulf of Tonkin Resolution, which enabled President Lyndon B. Johnson to take military action against North Vietnam. China delivered a dozen P-4 torpedo boats (improved Soviet Komsomolets-123s built under a license agreement) to North Vietnam between 1961 and 1964. The aluminum-hulled vessels were fast and maneuverable but they lacked radar. 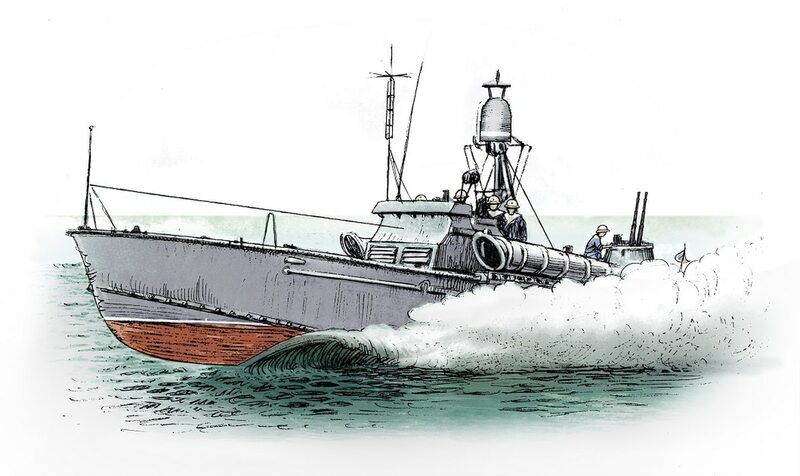 In the Chinese version, the torpedo boat’s Soviet-supplied 12.7 mm machine guns were replaced with more powerful 14.5 mm weapons. The modifications improved the P-4’s air defense but had a downside. The Soviets had trained the boat’s crews to fire their torpedoes when the machine guns’ tracers hit their target. The 12.7 mm machine gun’s tracer rounds gave a torpedo launch range of 800 meters (890 yards) with a 25 percent to 40 percent chance of success. But the 14.5 mm gun’s tracers went nearly 1,400 meters (1,540 yards), a distance that gave the Maddox time to evade. China provided radar-equipped versions in the late 1960s, although P-4s saw very little action after August 2, 1964. However, they were robust and easy to maintain and operate, providing useful operational experience to a generation of North Vietnamese naval personnel before being retired in the 1980s.